A movement pattern is what makes up a challenging workout. Not how many reps and how much weight you can lift, push, or pull. The quality of the movement is what really matters. 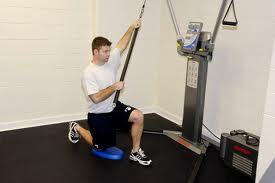 Can you squat, lunge, push, pull, move into 3 planes of motion, stabilize and balance your spine like you do in life? An effective and challenging workout is about you moving better and feeling better. It’s not about completely exhausting your nervous system and unable to move the next day because you are hurting so badly. A good analogy is the service and upkeep your car needs compared to your body. What happens when you forget about changing your oil or a tune-up for your car? You have a dirty or poor running engine, right? Well, your body needs a tune-up and oil change as well to run as optimized as possible. Remember those fundamentals? If you can’t or don’t do the basics, you’re probably going to break down sooner rather than later. Although it may not be immediately, eventually you are going to pay the price for neglecting an essential maintenance component .Your body is definitely not going to move better. You have to make sure your engine is primed and running on all cylinders. The master of fundamentals as far as I’m concerned was/is the late, great coach John Wooden. The coach used to drill and practice “the fundamentals” during every training session at UCLA. When game time came around his players were prepared. If you’re not familiar with Wooden’s Pyramid of Success you should be. The coach’s positive principles will power every person to new heights and achievements. Your workout “fundamentals” are the basics and although the TRX, suspension training, and kettlebells is trendy and hot right now you have to walk before you can run. Anyone can squat and lunge with assistance. Have you ever used a cane or walker? I’m being facetious here of course. I’m talking primitive patterns here where you need to be able to use your body. A gymnast and wrestler are great examples of athletes who have developed their bodies from the inside out. These athletes have tremendous core strength and stability which is where the fundamentals begin.